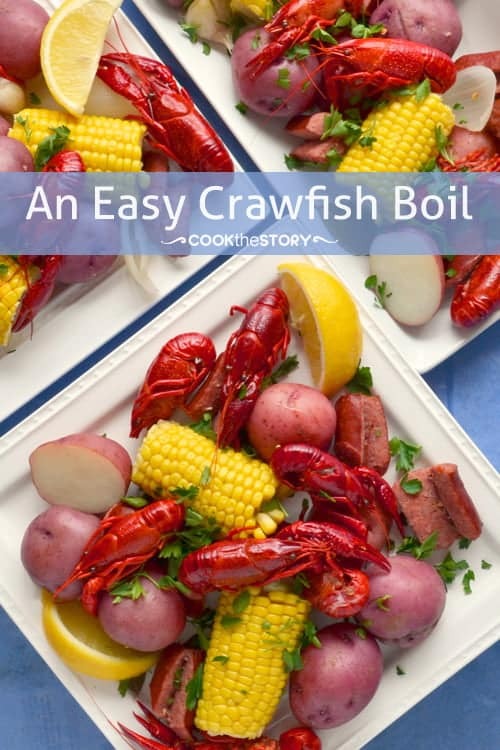 This easy crawfish boil recipe uses fully cooked frozen crawfish, available at many grocery stores in the US. It’s quick and tasty and lets you bring Louisiana home any night! If you’ve never done a crawfish boil before, the idea can be daunting. When you look into it you discover that you may have to order live crawfish delivered to your door. If you’re going to go this route, here are good sources for deliver: The Louisiana Crawfish Company and Kyle LeBlanc Crawfish Farms and here’s info on how to prepare live crawfish for the boil. If, on the other hand, you want to make this first crawfish boil easier on yourself, or if you’re hankering for crawfish and didn’t think to order ahead, today’s recipe is for you! 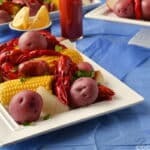 This crawfish boil recipe uses fully cooked frozen crawfish, which are available at many grocery stores in the US. There’s no need to do anything ahead of time to prep the crawfish. They just go for a quick dunk with the potatoes, corn, onions, lemon, andouille sausage and the flavors of Old Bay Seasoning and then they’re done. Oh wait! One more thing! You need to know how to peel and eat a crawfish. Check out this video of a guy who not only demonstrates how to peel a crawfish but also how to drink moonshine from a massive bottle. And here’s a quicker more consice video showing how to peel a crawfish from the Lake Charles’ Country Radio. I also found Southern Living’s illustrations of how to eat a crawfish helpful. This crawfish boil recipe is simple and delicious. For a fun and festive presentation lay colored food-safe tissue paper over the newspaper where your boil will be served. Fill a large pot with 6 quarts of water. Cut the whole lemons in half. Squeeze the juice into the water and add the squeezed lemon halves as well. Add the garlic, onion, red pepper flakes, allspice, bay leaves and salt. Tie the thyme and half of the parsley into a bouquet using kitchen twine. Add it to the water. Stir well. Cover and bring the water to a boil over high heat. Reduce heat to low and simmer 5 minutes. Add the potatoes. Cover and cook until they’re just tender, 9-10 minutes. Add the sausage and corn. Cook covered for 5 minutes. Gently add the frozen crawfish and cook covered until heated through, 2-3 minutes. Meanwhile, chop the remaining parsley leaves. 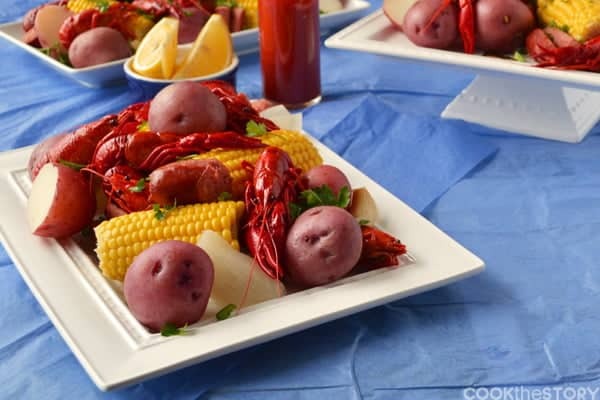 Use a slotted spoon to transfer the crawfish, sausage and vegetables to a large platter. Discard the herb bouquet. To Serve: Cover a table with newspaper (top with food safe tissue paper if desired). Pile the crawfish, sausage and vegetables right on top, or leave everything on the platter. Sprinkle with the chopped parsley. Put out the lemon wedges and hot sauce. Squeeze the garlic cloves from the skin as a condiment as well. Make sure there are a lot of napkins on hand before you dig in! *This crawfish recipe calls for fully cooked crawfish which are available at the fish counter in many states. If you’re lucky enough to get your hands on live crawfish, follow [url:1]a reputable source like this one for information about how to clean and prep the crawfish[/url]. Proceed with the above recipe with this adjustment: Before adding the crawfish to the pot, bring the water to a boil over high heat. Add the crawfish. When water returns to a boil, reduce heat to low and cook covered for 10-15 minutes, until the crawfish have turned red and have started to float. Crack one or two open and make sure that the meat is white and that all yellow fat is no longer runny. 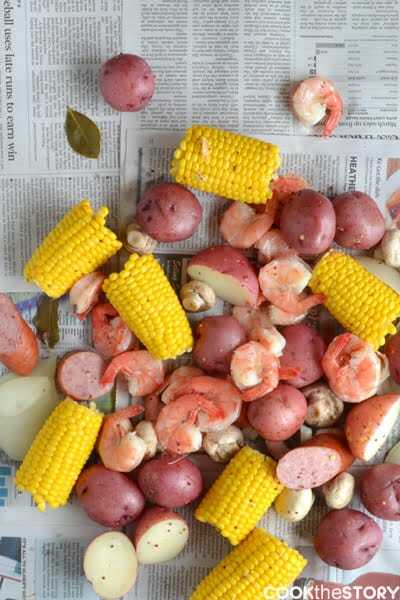 Here’s a little video with the basics of making a Shrimp Boil, complete with red potatoes, corn and much much more. Disclosure: I was paid by Black Gold Farms to develop this recipe and to post it on my blog. All opinions are my own. I will also earn a small amount of money from Amazon if you follow the link above to Old Bay Seasoning.